The Bucks are still in a spot where they just take whichever of the top 2 players in this draft falls to them. I could see Milwaukee trading this pick to Utah for their No. 5 pick and Derrick Favors, or two Philly for No. 3 and Thaddeus Young. The Bucks need a lot and it comes down to how much they like Parker or Wiggins. So the 76ers lose on their man Wiggins unless they are willing to give the Cavs more than just this pick and Thaddeus Young to move up. If they stay here they will take the best player not injured and that’s Exum. They drafted a big man last year by the name of Nerlens Noel who was also injured so I do not think they do that again. It is so hard for me to see Embiid fall any farther than this even if he is currently injured. His upside is too high for Orlando to pass on when the Magic could use a rim protector. A lot of teams could use what Embiid brings and I think Orlando takes him if he is here at No. 4 knowing that this draft is particularly deep at their main need: point guard. I think Utah takes the best available prospect which to them is Vonleh, but I do not know if he will be the fifth best player out of this draft. Utah could use a wing but it would be a reach for them to go Nik Stauskus or Gary Harris here. I could see Utah trying to move up to No. 2 or 3 and if that fails I could see them trading with Denver at No. 11, for example, and moving back to the teens. Gordan is a freak athlete that the Celtics could use right away. He has also been linked to the Celtics for a while now as they player they like at No. 6. Boston is trying to move this pick, but I think they end up staying put and taking Gordon who will make an immediate impact on the floor. Even with the foot concerns the Lakers have a lot of needs and Randle would fit nicely. I could see Randle being a more athletic Zach Randolph which would be a great pick at No. 7. The Lakers could also go Marcus Smart here and I think either player makes sense. A lot of team like Payton, a player who could come in a defend right away. He needs help with his jump shot and that could come with time. I think this fits in Sacramento even when the Kings re-sign Isaiah Thomas. But then again there have been rumors and I think the Kings will move this pick and not be on the clock at No. 8. McBuckets makes sense for Charlotte here and they would get someone who at worst will be just a great shooter in this league. I think McDermott will be a solid stretch four and next to Jefferson that could work out really well for a Hornets team that needs offense. The Sixers second pick of this draft is used on an athletic wing who can really shoot it. This may cause a jam in the young backcourt in Philly, but it is not worth reaching for a big man here. Could that mean Michael Carter-Williams is on the move if this is how the draft goes? Maybe. Or they find a way to use all three as they rebuild through the draft. This pick just makes sense for a Denver team that has a lot of young pieces already. Harris could come in a fill a need on the wing. I could see Harris being one of the top 5 best players out of this draft and is also NBA ready. I wouldn’t be surprised if he goes higher than No. 11. Well this worked out well for Orlando. If Smart falls to No. 12 it would be a home run draft for this franchise. They take Embiid at No. 4, who may be the best player out of this draft in a couple years, and get the point guard they wanted if he had come out last year here at No. 12. The Magic couldn’t plan this out any better. I am not sure Smart falls this far though, but it would have to be a team trading up to get him because I could not find a team currently slated in picks 5-11 that would take him. Minnesota may have a lot of needs very soon if and when Kevin Love gets traded. I think Love gets traded on draft night so get ready. If Minnesota still has this pick Young makes sense: an athletic wing who could turn into a good shooter and will be able to defend his position right away. Even though Saric has said he isn’t coming over to the NBA right away anymore that is okay for Phoenix who has three first round picks. If they do not trade some or all of the picks they will look to draft talent and stash the players overseas for a couple seasons. This works out perfect, but I think the Suns move at least one pick. The Bulls may not have either pick they currently hold in this draft as they may look to acquire Arron Afflalo from the Magic or they will trade these picks along with a player in order to clear cap space to get Melo or LeBron. The comparisons to Paul Pierce start with the mention of this name, so why not. One thing is for sure: this kid can score with the best of them in this draft. The Bulls are trying to get a point guard out of this draft if they keep the picks and now rumors are the Bulls favor Napier over Tyler Ennis. The Knicks and Phil Jackson have said they like Hairston and at No. 21 its a good pick. I just do not like the Knicks taking another shooting guard if they make a move to get into the draft. I would like to see the Knicks use Shumpert to get a pick in this draft to get a point guard or big man. The Grizz seem to always need a shooter and if Hood falls this fall it would be a great pick for them here. For some reason I think a team takes Hood in the teens. Kyle Anderson, a stretch four out of UCLA who can handle the ball is also an option for Miami here. Yes, another European guy if the Suns keep this pick. Phoenix does not want to keep adding youth to an already really young and growing roster. Surprise, surprise. The Spurs go with an overseas player. At this point it should be expected for them to take a player like this and to also hit on that player. 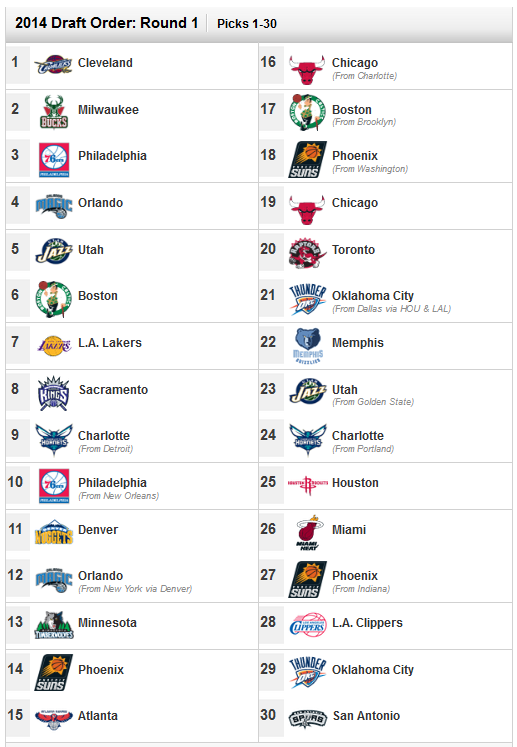 This entry was posted in Draft / Offseason, Home, NBA and tagged 2014 NBA Draft, Aaron Gordon, Andrew Wiggins, Cleveland Cavaliers, Dante Exum, Elfrid Payton, Jabari Parker, Joel Embiid, McBuckets, Mock Draft, Mock Draft 82.0, NBA Draft predictions, NBA Mock Draft, New York Knicks, Shabazz Napier. Bookmark the permalink.